The reflections of the bright summer Mediterranean sun on the Tyrrhenian sea is an excuse few people need for donning their shades when visiting the coast of southern Italy. And of all the shimmering, sparkling jewels one can imagine being the source of these reflections, none shines brighter than the island of Capri. 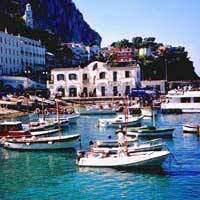 If the unforgiving rocky face of the Amalfi coastline is the beast in this picture, then the island that has attracted the rich and famous, along with tens of thousands of lesser mortals, is the beauty. Here, you’ll find fantastic vistas, both natural and man-made, the latter afforded by the luxury hotels happy to greet those with enough credit on their card. You’ll also find the femminello, a highly fragrant variety of lemon used in the production of Limoncello, a liqueur that enjoys Protected Geographical Indication, a quality scheme administered by the European Union. The fruit is grown in the groves that populate the island, and provide a bountiful early summer harvest that not only fuels production of Limoncello but also plays supporting roles in a number of dishes. Which is where torta al limone enters the proceedings . . ? Well, not quite because before settling down for a brief description of the virtues of this summer dessert, another aspect of island life should be pointed out – namely, noise. You see, the beautiful architecture of the island does not maintain itself; as a result building work and the accompanying hammering and drilling assault the ears from time to time, which is hardly conducive to promoting the feeling of peace and tranquillity the island’s councillors wish to propagate. As a result, an ordinance has been issued to run from April through to July 31, and then from September 1 to October 31, forbidding the use of noisy machinery during certain hours of the day. The ban extends throughout the entire day during August. Not surprising, builders have cried foul over the decision, pointing out that it represents a restraint of trade. Gardeners, too, have protested, given that their power mowers are another source of din. But to no avail. The news, of course, is music to the ears of the visitor, who can now look forward to the lapping of the sea, bird song, and the cut and thrust of chat and gossip as the backdrop to their passeggiata or evening meal. Which brings one neatly back to the subject of torta al limone, a piece of cake to make but even easier to digest, perhaps accompanied by a small glass of dessert wine, or if sampled in the afternoon with nothing stronger than a mineral water that will serve to keep the palate free to concentrate on the sharp, slightly sweet crumb likely topped with a dusting of icing sugar. Place the ingredients together in a food processor and whizz to produce a wet mix. Pour into a springform tin, place in an oven preheated to 180ºC (gas mark 4) and bake for around 45 minutes. To check whether the cake is firm but still moist, gently press your middle finger against the centre – a little give in the crumb is what you are looking for. Then simply remove, unclip the side of the tin and place in a cool place to rest. Before serving, dust the cake with a generous amount of icing sugar. For those who desire a little more luxury with their torta al limone, a slice can be accompanied by a number of garnishes – perhaps some summer berries, or a coulis (purée) made from the berries; alternatively, a scoop of gelato or ice cream will be similarly successful. All you need to complete the picture is a quiet place to enjoy your torta. It may not be Capri, but the lemon accents on your palate should be more than enough to evoke happy memories of your tranquil days watching the waves on the Tyrrhenian sea.